When you are comparing Local Austin Dumpster Rental, rental prices, you will want to keep the rental cost as low as possible. 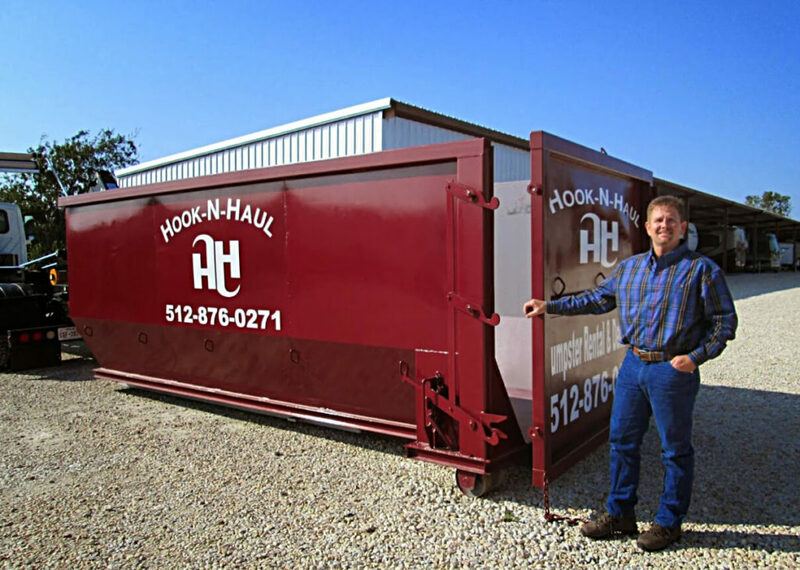 When you call Hook-N-Haul, we can quote you a low-cost and very affordable price right over the phone and schedule your Local Dumpster Rental delivery in Austin area all at the same time. Hook-N-Haul Dumpsters cares! We work hard to decrease our carbon footprint while still providing you with quality service. Our fleet of hauling trucks runs on compressed natural gas (CNG), fuel that produces only half the emissions that federal guidelines allow. Our goal is to make our communities in and surrounding areas cleaner, safer, and stronger, and we do everything we can to promote that philosophy. Operating one of our CNG trucks is the equivalent of removing 100 vehicles from the road. Your green waste, recyclables, construction waste, and other debris need somewhere to go. 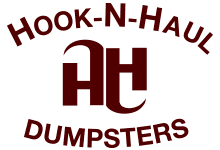 Hook-N-Haul Dumpsters Disposal technicians are fully trained and experienced in recommending the appropriate size of mini-bin, dumpster, or roll-off container to suit your needs. From drop-off to pick-up, you’ll be treated with professional courtesy and efficiency. We collect so much stuff in life, and a lot of it sits around doing nothing. Boxes, food containers, packaging materials, construction leftovers, and more seem to crowd into our lives by the ton. When it comes to taking out the trash, however, we often do it without thinking of the consequences all that stuff will have in our community and for our planet. At Hook-N-Haul Dumpsters, our goal is three-fold: to provide the right types of containers to fit your needs, to promote safe environmental practices in trash disposal and recycling, and to provide excellent customer service. Your community is our community. We live and work among you, and that’s why we strive to be the best we can be in both our business and our commitment to keeping our towns and cities safe and clean. Dumpster dimensions for a 10 yard Dumpster Rental are: 12 ft. long by 8 ft. wide by 3.6 ft. high. This size is usually sufficient for the debris from 1500 sq. ft. of single layer roof shingles, small yard or garage debris cleanup, or a small interior remodeling job or small deck removal job. Dumpster dimensions for a 12 yard Dumpster Rental are: 13 ft. long by 8 ft. wide by 4 ft. high. This size is usually sufficient for the debris from 2000 sq. ft. of single layer roof shingles, large yard or garage debris cleanup, or a large interior remodeling job or carpet removal, or waste from a 300 square foot of deck remodeling job. Dumpster dimensions for a 30 yard Dumpster Rental are: 30 ft. long by 8 ft. wide by 6 ft. high. This size is usually sufficient for the debris from 2500 sq. ft. of single layer roof shingles, large yard or garage debris cleanup, or a large interior remodeling or exterior siding job or window replacements or construction of a new home, removal of an edition or garage. Dumpster dimensions for a 40 yard Dumpster Rental are: 18 ft. long by 8 ft. wide by 7 ft. high. This size is usually sufficient for the debris from 4000 sq. ft. of single layer roof shingles, very large yard or garage debris cleanup, or a very large interior remodeling or exterior siding job or window replacements or construction of a new home, removal of an edition or garage or a commercial building construction or remodel job.